Liberty’s Kids is an animated educational historical fiction television series produced by DIC Entertainment, originally broadcast on PBS Kids from September 2, 2002 to April 4, 2003, although PBS continued to air reruns until August 2004. The show has since been syndicated by DiC to affiliates of smaller television networks such as The CW and MyNetworkTV and some independent stations so that those stations can fulfill FCC educational and informational requirements. Since September 16, 2006, the series aired on CBS’s new block called KOL Secret Slumber Party on CBS, then it was aired on KEWLopolis, which taking September 12, 2009. In 2008 it ran on The History Channel. The series is currently on the Cookie Jar Toons block on This TV and CBS’s Cookie Jar TV. In 2012, qubo announced the channel will air Liberty’s Kids in fall 2012. The series was based on an idea by Kevin O’Donnell and developed for television by Kevin O’Donnell, Robby London, Mike Maliani, and Andy Heyward. 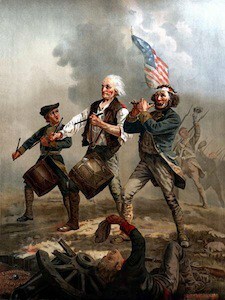 Its purpose is to teach its audience about the origins of the United States of America. Much like the CBS cartoon mini-series based on Peanuts; This is America, Charlie Brown years before, Liberty’s Kids tells of young people in dramas surrounding the major events in the Revolutionary War days. 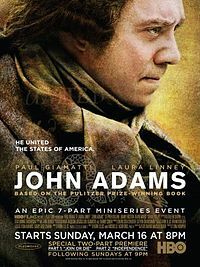 Celebrity voices such as Walter Cronkite (as Benjamin Franklin), Sylvester Stallone (as Paul Revere), Ben Stiller (as Thomas Jefferson), Billy Crystal (as John Adams), Dustin Hoffman (as Benedict Arnold), Arnold Schwarzenegger (as Baron von Steuben), Liam Neeson (as John Paul Jones), and Don Francisco (as Bernardo de Galvez) lend credence to characters critical to the forming of a free country, from the Boston Tea Party to the Constitutional Convention. The shows run a half-hour, including commercials. On the PBS Kids broadcast, these are replaced by segments that include “The Liberty News Network” (a newscast delivered by Cronkite summarizing the events of the episode, with each including his signature sign-off “that’s the way it is”), “Mystery Guest” (a guessing game where the kids guess a historical figure, who often is a character in the episode), “Now and Then” (a segment comparing life in the Revolutionary Era and today), and “Continental Cartoons” (a rebus word guessing game). 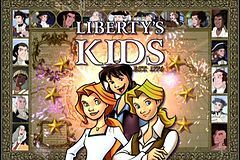 Liberty’s Kids features Benjamin Franklin and four biased fictional associates of his in their experiences during the American Revolution. Although the series spans 16 years from the Boston Tea Party in 1773 to the ratification of the U.S. Constitution in 1789, none of the main characters appear to age, except for Dr. Franklin. The opening theme to Liberty’s Kids, “Through My Own Eyes,” is performed by Aaron Carter, who also voices Joseph Plumb Martin, appearing in episodes 24 and 36, and Kayla Hinkle, a country singer who also voices Sybil Ludington, appearing in episode 21. However, only the chorus, the second verse, and the third verse of the song serve as the series’ opening theme. The following are the Liberty’s Kids episodes, with links to relevant historical articles. The show was funded in part by the Corporation for Public Broadcasting and the viewers/stations of PBS. On October 14, 2008, Shout! Factory released Liberty’s Kids- The Complete Series on DVD in Region 1. The 6-disc box set contains all 40 episodes of the series as well as several bonus features. This release has been discontinued and is out of print. On July 16, 2013, Mill Creek Entertainment re-released Liberty’s Kids- The Complete Series on DVD in a 4-disc set.